Martin’s strong start in Farmington propelled him to his first victory of the season. Eastern Nationals – Farmington, N.Y. 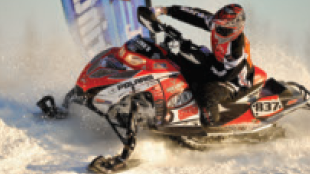 The fourth round of the AMSOIL Championship Snocross Series took place in Farmington, N.Y., where Martin took advantage of a strong start and a quick charge to the front in the Pro Super Stock final to earn his first victory of the season. Fighting heavy traffic on the first lap, Martin soon began pressuring race leader Dan Ebert and made the pass into the lead about a third of the way through the race. He was not challenged the rest of the way. In the AMSOIL Pro Open class, Martin again ran a solid race, finishing second behind Hibbert. Malinoski rounded out the podium in third. Michigan National – Pontiac, Mich.
Martin continued his strong racing at the Pontiac Silverdome in Pontiac, Mich., jumping to an early lead in the Pro Super Stock final before he was overtaken by Hibbert with five laps remaining. Martin took the second-place podium. After a first-turn pileup induced a restart, the AMSOIL Pro Open final saw Tim Tremblay jump out to a massive lead with Hibbert and Martin giving chase. Hibbert went down on the back straight, leaving Martin to concentrate on closing the gap on Tremblay. With seven laps remaining, he passed Tremblay and earned the win. Malinoski worked through the pack and held off Hibbert to take third. Team AMSOIL was well-represented at the 2011 ESPN Winter X Games, earning some hardware during the high-profile event. The opening night of competition featured Team AMSOIL/ Scheuring Speed Sports rider and defending gold medalist Justin Hoyer competing in the freestyle competition. Holding the top score after two rounds of eliminations, Hoyer was the last rider to compete in the final round and needed to top Daniel Bodin’s 91.66 score for a shot at the gold medal. Although a small hand check on a no-handed landing may have cost him the gold, Hoyer’s 91.00 run was enough for the silver medal. 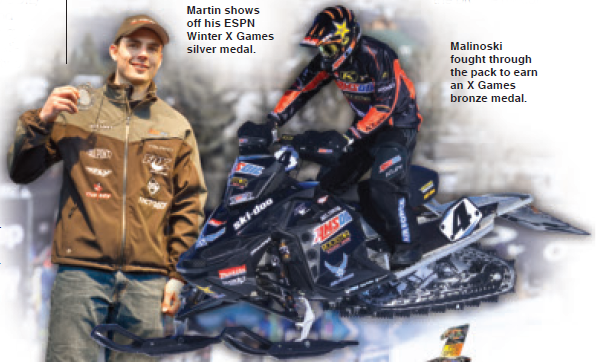 AMSOIL-sponsored snocross rider Mike Schultz is no stranger to the Winter X Games podium. Despite losing his left leg during a pro snocross race three years ago, Schultz remains dedicated to the sport and earned the gold medal in the adaptive snocross event. Although Tucker Hibbert won his fifth straight snocross gold medal, Team AMSOIL/Judnick Motorsports racer Ross Martin pushed through the field to earn his second straight silver medal and Team AMSOIL/Scheuring Speed Sports racer Robbie Malinoski overcame a poor start to earn the bronze medal. AMSOIL Racing has a new home on the World Wide Web. Debuting in March, https://www.amsoilracing.com/ is a sleek website dedicated to everything related to AMSOIL racing and promotional events. The new website layout provides easy navigation and features up-to-the-minute racing news, while allowing the company to provide a vast selection of exciting videos. As with the previous AMSOIL racing pages on https://www.amsoil.com/, the new website at https://www.amsoilracing.com/ allows AMSOIL Dealers to provide racing links on their own websites that are embedded with their Z.O. numbers, allowing them to receive credit for sales once visitors check into the AMSOIL Online Store. To link a Dealer website to the new racing website, simply use the same basic linking syntax used to send visitors to the AMSOIL website: www.amsoilracing.com?zo=xxxxxx (replace xxxxxx with ZO#). The racing website will track visitors for a set number of days, and if they choose to follow a product link back to https://www.amsoil.com/, the referring Dealer will receive credit for any sales.